After the Diamondbacks lost to the Mets earlier in the day, the Rockies (25-22) had first place in sight heading into Sunday’s game with the Giants. 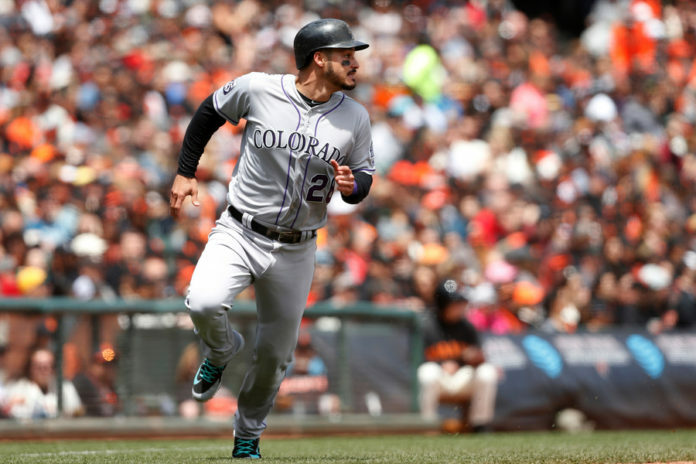 The Giants (24-24) squandered those hopes though, defeating the Rockies 9-5 to split the four-game series. Things looked good the the Rockies early, as they jumped out to a 4-1 lead. Starting pitcher Tyler Anderson gave up a first inning triple to Giants catcher Buster Posey, who scored shortly after, but Anderson rebounded well and was able to work three consecutive innings of scoreless baseball. 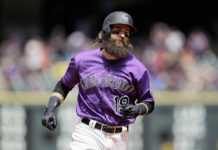 The Rockies young pitcher commanded the strike zone and worked comfortably through the Giants lineup in the early innings, until giving up a two-run home run to left fielder Gorkys Hernandez in the bottom of the fifth inning. After sneaking out of the fifth inning with a 4-3 lead, Anderson ran into traffic again in the sixth inning and was replaced by Bryan Shaw. Shaw inherited a pair of runners on base from Anderson, both of which scored to put the Giants up 5-4. 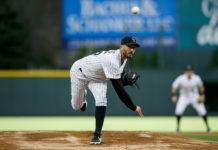 Anderson’s final line reads 5.1 innings, six hits and five earned runs, but the Rockies young pitcher really pitched well until the fifth inning. While the pitching was up and down Sunday, The Rockies offense kept them in the game Sunday. Third baseman Nolan Arenado picked up three RBI, including a crucial single in the seventh inning to tie the game at 5-5. Arenado followed up the game-tying ribbie by stealing second to get into in scoring position. The successful steal was Colorado’s second of the inning and 13th consecutive successful attempt by the club this season. The Giants quickly killed the Rockies momentum with a four-run seventh inning of their own though, all four of which came via the home run. Those runs would prove to be the final nail in the coffin for the Rockies. Rockies reliever Jake McGee took the loss Sunday, giving up two runs in less than one inning of work. Will Smith recorded the win for the Giants. 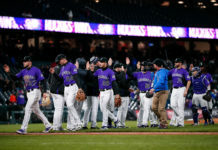 Rockies manager Bud Black certainly has to be disappointed with Sunday’s final results, but is likely pleased with the production he received from Noel Cuevas, who while playing left field for the first time this season was able to make a phenomenal diving catch, and also tallied two RBI at the plate. The Rockies will look to quickly rebound in Los Angeles. The three-game series with the Dodgers (20-26) will be the first time that the NL West rivals have faced each other this season. German Marquez will be on the hill for Colorado and Walker Buehler will make the start for Los Angeles. Buehler is coming off of his worst outing of the season, giving up 5 runs in five innings last Wednesday in a loss to the Marlins.